A Facebook reader commented, “That would be the ineptitude of the editors, don’tcha know….” Yes …if newspapers had enough editors to actually look over the stories before publication! Another chimed in, “But, isn’t that what they are supposed do? Verify accuracy ‘before’ going to actual print? Cutting corners (payroll) is no excuse for missing mistakes. Even at an establishment such as this.” I replied: “Supposed to”? Sure. But have newspapers cut corners too much to actually DO it consistently? Yep — most of ’em. Since skimming large quantities of news articles is part of what I do as a news commentary writer, I see this kind of thing a lot …and it’s pointing to a real, and growing, problem. 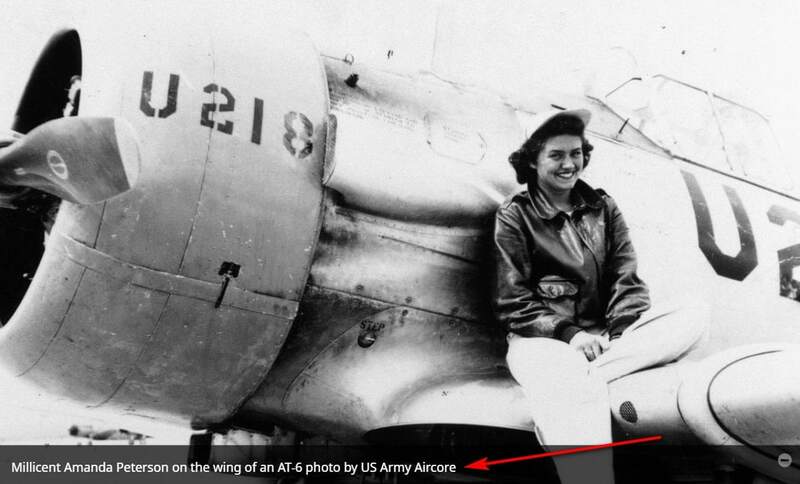 Today, while researching this week’s Honorary Unsubscribe, I noticed a reporter at the Colorado Springs Gazette had identified a photo source as “US Army Aircore”. Aircore?! Maybe she means the U.S. Army Air Corps? Does she call the USMC the “Marinecore”? I don’t know where the blame lies, but there’s probably a lot to go around. Yet teachers are overworked, with too many kids in each class. Sure “kids are lazy,” but they need to be inspired by teachers and parents …and parents are working two jobs to pay the mortgage. Newspapers were squeezed by the Internet, and still can’t figure out how to thrive, yet owners want to keep profits up — so they fired the experienced reporters and editors to get greenhorns on the cheap, which makes news consumers lament the resulting low quality, and not want to pay for it anymore. It’s a race to the bottom. The publications refusing to play the game are few and far between. Still, reporters want to be treated as professionals. Great: then act like professionals. Think about what you’re writing and what the words mean. Yes, we all make typos sometimes, and screw up homonyms and such. But there has never been an Aircore, in the U.S. Army or anywhere else, and it’s almost impossible to make such an error if you actually know what it is you’re talking about. Especially in Colorado Springs, the home of the fine educational institution of the descendant of the U.S. Army Air Corps, the U.S. Air Force Academy. Or maybe I’m just getting to be a grumpy old man? Nah: that can’t be it. I get the digital edition of the Washington Post, and a while back I finally wrote them about a recurring problem in their stories. They would repeat paragraphs, word for word, sometimes with intervening paragraphs, sometimes with the repeat following immediately after the initial appearance. Since I wrote I have noticed an improvement, but it still happens. You don’t have to be old to be grumpy. Some of us just mature early. This problem just keeps getting worse. I just read that the local newspaper is having another buyout. Those eligible must have over 10 years of experience and be above 50, in other words, those who have a clue what they are doing. Oh well. I will only get the daily paper until my Golden Retriever passes away. He has to have his job of getting the paper every morning. I’ve use air core transformers, but that’s two separate words. Should it be “Yes teachers”? There used to be a thing called a “proofreader”. This has been replaced by the “spellchecker” which will read a full page of gibberish and, as long as all the words are spelled correctly, will report no errors whatsoever. I have written to several news publications pointing out egregious spelling or grammatical errors and offering my services for a very low wage. So far, no takers. First, look at how many kids enter college unprepared and have to take remedial classes. If they are not taught in elementary and high school, where does the fault lie? And where does it end up? It ends with reporters not knowing how to spell, with editors not knowing how to recognise spelling and grammatical errors, and with the readers of newspapers becoming too frustrated to pay the price for the paper. When you keep doing what you are doing, you can expect to keep getting what you’ve been getting. When we allow poor education to pass, when we allow poor students to socially pass, we will get misspelled newspapers, reporters that do not know the difference between “core” and corps,” and news readers that can do nothing but read off the teleprompter. I think a major contributing factor is not reading enough. Instead of just watching or listening, folks should be reading. That way one’s eyes can recognize when something doesn’t look right. But today’s newspapers aren’t helping. I’ve been noticing this sort of problem too, as well as a growing tendency among people who make these sorts of errors regularly to become very hostile when they are pointed out. Some of them have even started claiming I am the one who is wrong, because of linguistic drift. It is what a friend and I call, changing the “definition of words” to fit the narrative. I blame phonics, the practice of spelling as the word sounds, which is a huge trap with English. Starting with phonics is the tried and true successful method. Allowing it to continue — telling kids “It’s OK, people will know what you mean” while not taking points off all sloppily done work — is where using it becomes a negative. Excuse me, that should probably be “phonetics”, not “phonics”. When a word is spelled phonetically, it is spelled as it sounds without regard to its correct spelling. “Phonics” is the basic teaching of how letters and combinations of letters sound, so that a child (or an adult, for that matter) can learn how to read by decoding the letters on the page. This was the established way to successfully teach reading to children for a couple hundred years. Then “sight reading” became all the rage, and children were no longer taught how to sound out an unfamiliar word. In my opinion, the beginning of the downfall of basic literacy — when it becomes difficult to read a complex word, then people (including adult reporters!) will stop using that word and find simpler ways to express the idea, further contracting the language. And sometimes, there IS no “simpler way to express an idea”. Sometime people go the other way and use bigger, more ostentatious words to make their writing appear more “sophisticated” or “important”. I work with a woman who always tells our customers, “Thank you for utilizing our products.” I want to ask, “What’s wrong with the word ‘using’?” Of course, she makes sure that her email signature says, “MBA, CFP” after her name (which really has no relevance in our business line). That is probably a coincidence though (note the sarcasm here). No one says “medicine” any longer. You almost always see “medication”. I could go on and on. Another common “playing it by ear” transgression is when people write “should of” and “could of” because that’s how their brain translates it when they hear “should’ve” and “could’ve”. Or how about “a whole nother”? I can understand saying it without thinking too hard about it, but I see it in print and can’t fathom someone typing the word “nother” without pause. Where is your Es spree decor? Oh RC. I can’t believe you’s misspell the word “misspell”! Or did you do that on purpose, tongue-in-cheek? “I did it on accident!” No. You did it by accident. No one knows the difference between, there, their, and they’re or when to use one of them. Also, your and you’re, are and our, to, two and too. I have often seen “affect” and “effect” used interchangeably. Then there are the so-called military writers talking about the military needing more “ordinance”. No, they don’t need more municipal laws. They need ordnance. Sigh. This is the dumbing-down of our country. “on accident” grates on me, but it IS parallel with “on purpose”. Why isn’t it “by accident” and “by purpose”? Because it’s an idiom. And I’d argue that idioms are more likely to drift than other usages, though I can’t defend that. Whatever the cause, this loss of coherence is a problem that needs fixed! You, a “grumpy old man”?! Heavens to Betsy & shudder the thought! Actually, shouldn’t it have been “strong-armed” (the past tense of “strong-arm”)? As to the cause, it’s not just an education problem. Students can be well educated & still use incorrect language like this instance. I credit my language skills not to my education (I have a B.S., an M.S., and about 30 years of experience in Computer Science), but to my voracious reading habits (I have >300 books in my library & have probably read 500-1,000+ books so far). I personally think that if you read enough good writing, you’ll learn to recognize bad/incorrect writing. Which will help you avoid making boneheaded mistakes like these in your own writing. You’ve hit another of my pet peeves: folks don’t understand how adjectives work. 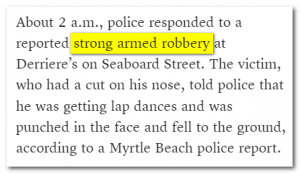 “strong-arm robbery”: “strong” modifies “arm”, so the hyphen is needed. 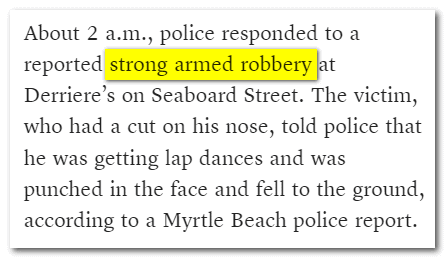 “strong arm[ed] robbery”: “strong” modifies “robbery”. But 99% of people can’t seem to figure this out for some reason. Yup, the other day I read a story about a man who was tragically killed in an accident. The reporter stated that the wife’s salary was cut in half. Wouldn’t it be her income? But this is reporting today. So is it Corpsman or Corps Man? Sadly we had a President of the United States, a Yale grad I believe, who pronounced Corpsman “Corpse man”. Nothing political here…just an example of the sad state of education in the country. It appears to me the terms ‘strong arm’ robbery and ‘strong armed robbery’ are interchangeable. Lawyers and various states tend to use one or the other. More interesting is that strong arm(ed) robbery is a lesser crime than simple armed robbery. This would tend to favor the use of the term strong arm. In any case, I wouldn’t equate the writer/editor who wrote/reviewed (or didn’t) “strong armed” with the ones writing/printing Army Aircore. The latter’s editor is rotten to the (former) Corps. (Puns intended). I have noticed the same type of mistakes in our local newspaper as well. What worries me is that the generation presently ‘learning’ atrocious spelling, grammar and so on will shortly be the teachers for the next generation. I would not be surprised if the teacher training course entrance exam ‘forgives’ errors made by applicants on some spurious grounds like ‘enthusiasm is more important’. Possibly the worst ‘spell it like you say it’ I ever saw was “ay wallah” in lieu of ‘et voila’. I still shudder when I think about it — and as a professional writer and editor in a technical field for well over 30 years I can assure you I’ve seen plenty of lesser howlers. But I am beginning to see a systematic shift to something far worse: emails that are dictated using voice recognition and sent unchecked. In my technical field, a missed homonym can have unfortunate consequences. Thankfully we do have two experienced editors who spot most things but as there’s ONLY those two people to produce a monthly, world-class, 100+ page magazine — and each has other responsibilities too — there are occasions when something slips through. Interestingly, a comparable publication from a sister organisation has an editorial and production staff of nearly two dozen. No wonder I feel overworked! Homonyms seem to be the worst trap. Taking the Futurama DVDs for an example, I can understand that sometimes the subtitlers don’t know the mathematical jargon that gets thrown around from time to time and so it gets mangled. But when they put “peaks” instead of “piques” in the subtitles, that’s just poor vocabulary. As a voracious reader, I can’t afford to buy many physical books (and in any case our bookcases are highly overburdened as it is), but I have hundreds of books on my Kindle that are or were free — often the first book of a series, etc. Some of them are clear, but most have a few errors like this and a certain percentage are absolutely riddled with them — those tend to be the ones that I delete from my library because they are just too painful to read. The phonetically spelled foreign phrase seems to be quite common. “Per say” seems to be the worst offender; I see it all the time. Like Giles, I’ve also seen “wallah” for “voilà”. The question is: how can we change this? How can we ensure that at least those people whose work is with words actually know how to use them? As you noted, economic pressures are driving a race to the bottom in many cases, and I can’t see an easy path to increased literacy in that environment. @Tom, Naples: “Do you want to go/come with?” looks like a German-ism to me. Could there be native German speakers in your wife’s ancestry? @RC: I thought “to try and do (something)” was a correct, if colloquial, idiom? Is it wrong, or just inappropriate in formal writing? …what bothers me about the phrase “try and,” which is that if you use and, as in your example sentence — I’m going to try and call Grammar Girl — you are separating trying and calling. You’re describing two things: trying and calling. When you use “try to” — as in I am going to try to call Grammar Girl — you are using the preposition to to link the trying to the calling. “Try and” irritates me every time I hear it….and I hear it more than “try to”! While we’re complaining about errors of usage, according to my dictionary, it’s arguably not possible to mix up homonyms — words which differ in etymology and meaning, but have the same sound and spelling, as in the bear bears a burden. More properly, the words in question here are homophones, differing in spelling and meaning but having the same sound, like the infamous they’re/their/there. There is also the homograph, words spelled the same, but differing in meaning, and possibly in pronunciation — i.e. lead someone through the lead smelting plant.